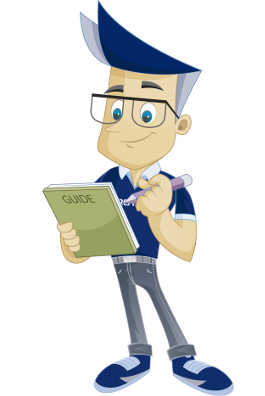 This guide details how to install a script via Softaculous in cPanel. 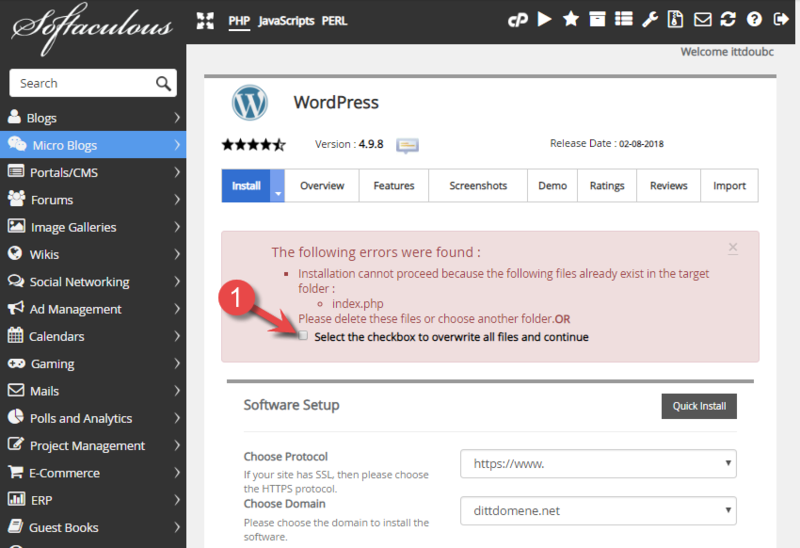 In this example we show how to install the script Wordpress. The approach will be the same for all scripts that can be installed, with the exception that different information is required during the installation of the different scripts. If you have active installations, installed via Softaculous in your web hosting, you will find these under "All installations". To find the script you want to install you can search directly or sort/navigate from type. 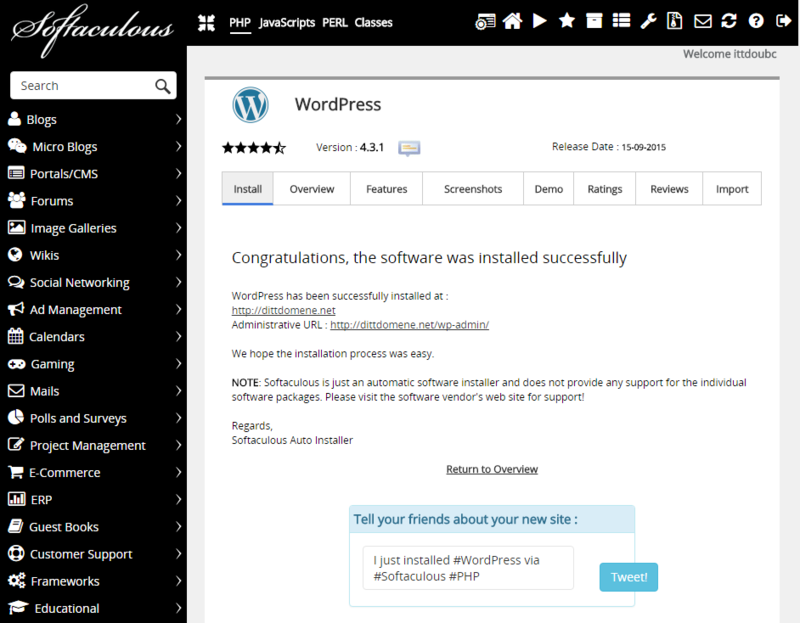 Here, we choose to install Wordpress. Here we have to add wanted information regarding the script we are installing. Certain settings repeat themselves in most scripts, and will therefore be explained a little closer. Choose which domain the script should be installed on. 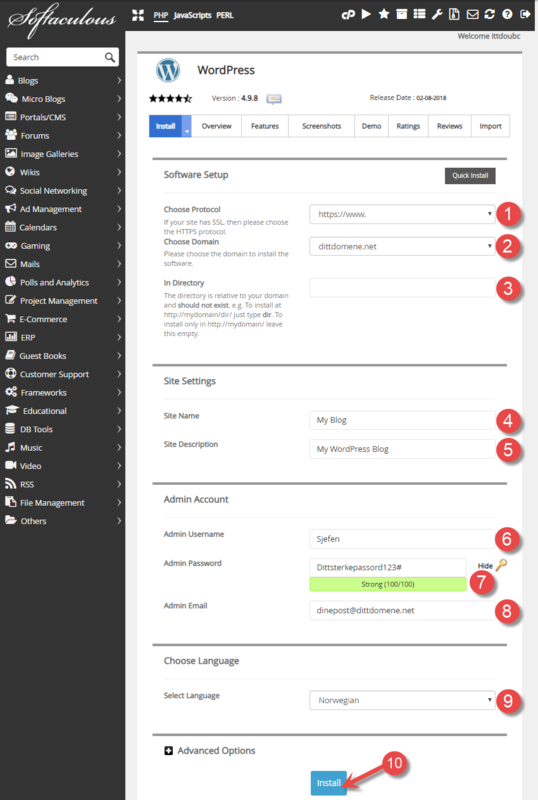 If you own several domains and/or sub domains, these will be shown in the menu here. In our case Wordpress will be installed on the main domain: yourdomain.net. Choose which folder the script should be installed in. We want the script to be run straight from the root of our web hosting account (/public_html) and therefore we don’t write anything here. If we were to write i.e. "folder" here, the script would be installed in the folder "/public_html/folder". "Table Prefix" specifies which prefix that should be used for all tables in the database for the script. Unless you have specific demands can this stay like this "Softaculous" suggests. Type in a fitting name and description of the installation. This can be changed later. Type a username for the administrator user for the installation. Type wanted password for the administrator user. Type the email address of the administrator. Choose which language you want for the installation. Click "Install" to start the installation. If the account has not been used for anything before, there will be a standard "index.php" file in the root. During the installation you might get this error message. If you don’t wish to keep the index file that is already there, tick this box and scroll down and click "Install". When the installation is completed, a window will pop up to confirm this, and also lists the addresses of the script and the administrator interface. These will also be sent to the email you specified under step 6, point 11. 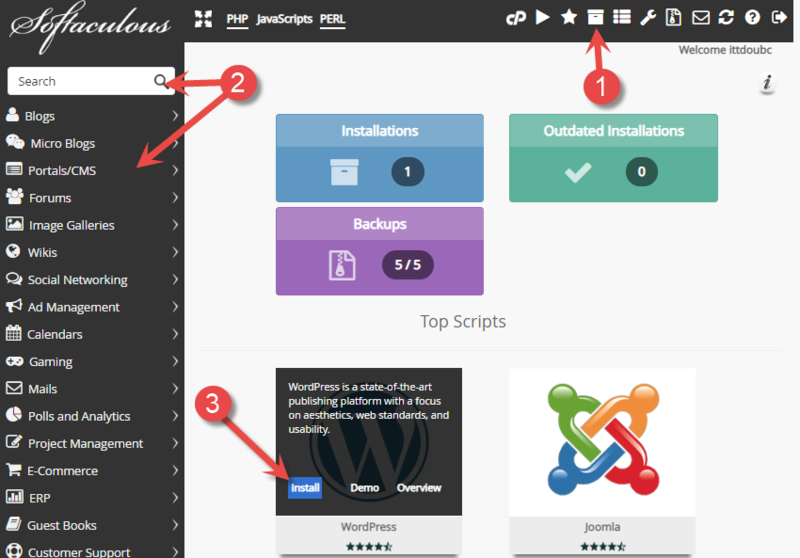 We have now covered how to install a script via Softaculous in cPanel.